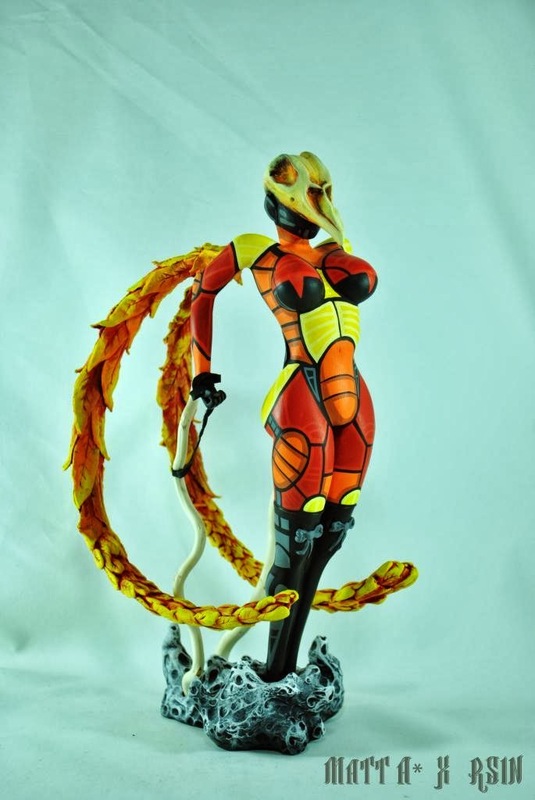 "Booty Babe Art(TM) is one man’s way of expressing his passion for fantasy art, toys, fashion design, and of course the wonderful variety of female beauty. In effect the project is a tribute to the women that make our day, taking the very definition of “Booty Babe” to new levels..."
After ten years of working as a Toy Designer in Los Angeles, Spencer Davis combined all that he is passionate about a waged his own path. Since then he has realized dreams of self-employment, constructed an office / work space, and over the years has managed to produce and sell over 10,000 of his voluptuous creations. Surviving challenges of recession, skyrocketing costs of production, and family life, check out his progress as he wraps up the final few days of his Kickstarter campaign, with hopes of producing a 20' shipping container filled with 5 NEW Booty Babe statues to choose from. The Kickstarter has already reached it's goal which means that the items are guaranteed. 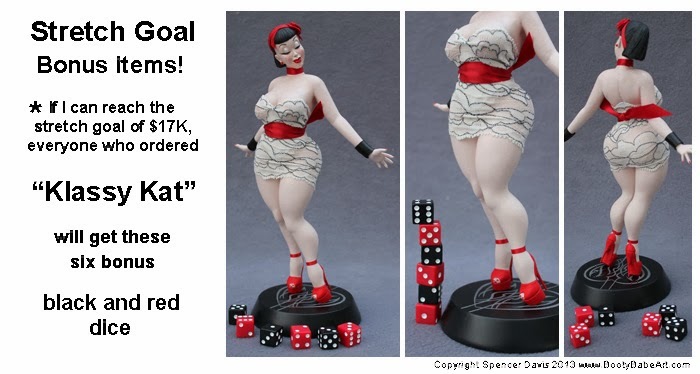 In addition they have reached their first stretch goal and are only $700 shy of the next stretch goals. 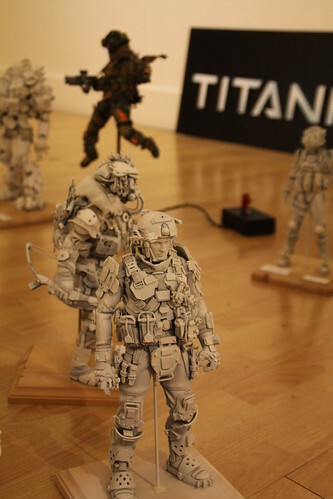 THese are beautifully designed and crafted sculptures and the rewards are amazing. They even include tiers where you can get your own likeness sculpted as a booty babe. Check out the Kickstarter and follow Booty Babe on Facebook. U wanna be in my gang? 3AA! 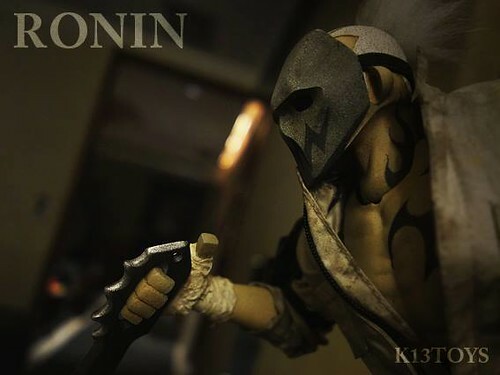 Its that time of year again, if your a fan of threeA. 15th January 2014 is the date you are able to renew or start your 3AA membership. The long awaited 1/6 Lasstranaut is included, I'm sure 2014 will break records for threeA membership. There is toooooo much info to get across, so Ive just cut and paste from the official info I got through, but enjoy some images first! 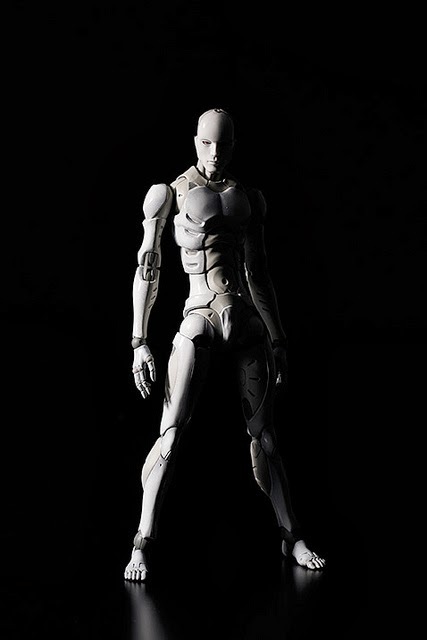 3AA 2014 Membership Set featuring the long-awaited Lasstranaut 1/6th Scale Figure from Ashley Wood's Popbot Series. Without a doubt the 2014 3AA membership set is the best yet, from the long awaited Lasstranaut figure to the beautiful packaging design, it sums up 3A's completely! 3AA has always been special to us, its the clarion call to the Legion, from the first set with the 1/12th Bramble its has been a point of pride and love for where we have been and where we are going! Join us in 2014, we can all hang out together with WWR, POPBOT, ADVENTURE KARTEL, ISOBELLE PASCHA, EVENFALL and many more ORIGINAL worlds! And lets not forget the Ashley Wood redesign of MARVEL characters! We also have a many surprises along the way from Ashley Wood and other fantastic designers/artists! All 3AA 2014 exclusives and KLUB releases will be limited one per customer. Excluding the current TKLUB TQ sale started in 2013. 15% off all sales at Bambalandstore.com and conventions or shows where 3A has an official booth. 24 hour buying window for any 3AA exclusive or 3AA variant. 1/6th Scale Lasstranaut Collectible Figure from Ashley Wood’s Popbot Series. Not to be re-released in any other colorway. Lasstranaut Art Book (12” x 12”, Softcover, 32 pages). White T-Shirt with Lasstranaut Design & Illustration on Front and Back (XS, S, M, L, XL, 2XL). Vellum Top Sheet with Lasstranaut Painting by Ashley Wood (approx. 17.5” x 17.5”). Lithograph with Lasstranaut Painting by Ashley Wood (approx. 17.5” x 17.5”). Illustrated Box Set Containing All Contents Listed Above. For all of the 3AA Members that have been with us for all the past six years - when you purchase the 2014 set, we're including something extra as a special thank you for your support and loyalty from the beginning. Everything from the main 3AA Set listed above is included, plus Lasstranaut's Long Lost Space Garb - One of four random designs in a stylish box. 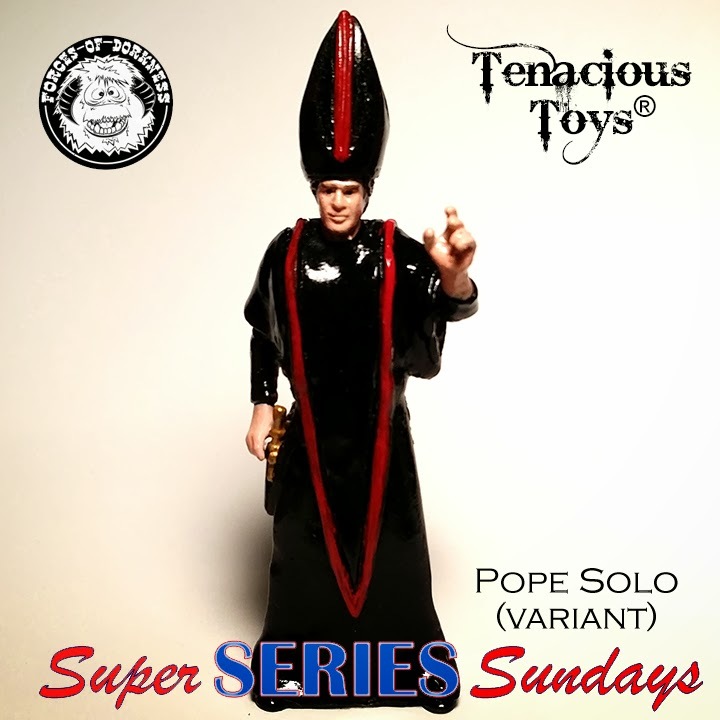 This Super Series Sunday, January 12th, we release the third and final resin figure in the Forceolicism series by our friend and associate Scott Kinnebrew aka Forces of Dorkness. Pope Solo is a 4.5 inch tall resin sculpt featuring Harrison Ford's Han Solo mashed up with the Pope, complete with Han's blaster and the Pope's mitre. Scott Kinnebrew made 15 of each colorway: White (standard) and Black (variant). Each piece is priced at $40 and blind-bagged. Customers purchasing 2 figures are GUARANTEED to get one black and one white figure. 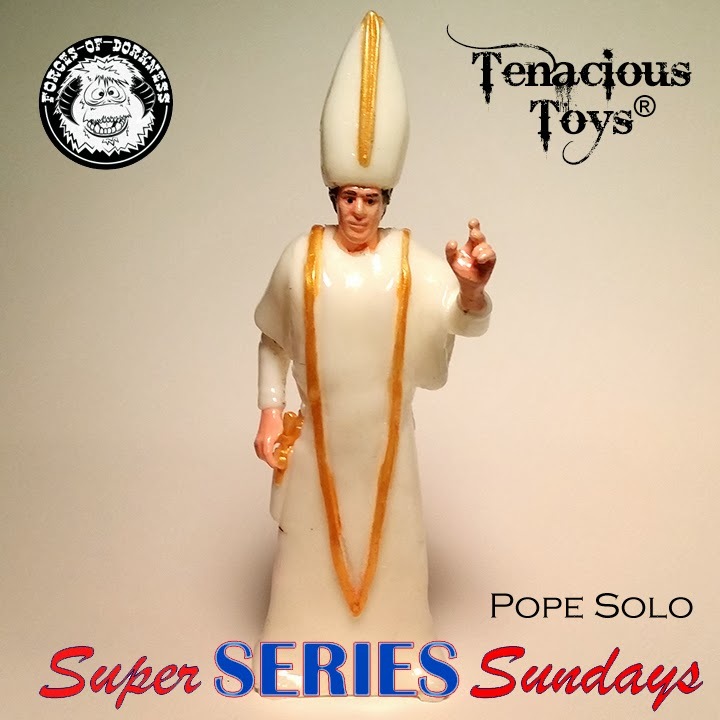 Pope Solo drops on the Super Series Sundays page at 6PM EST on Sunday January 12th. Matt A* has teamed up with Rsin to produce a great painted original sculpture being named "Hindrance of a Whisper". Artist Matt A*, Matt Anderson, is a fantastic sculptor, however, he is colorblind. This leads to a lot of created pieces being a bit color muted. Enter Matt's friend and artist, Rsin. Rsin has become great with a color palette, having come a long way from sticker applications. Standing a good 12 inches, Matt A* created the original sculpture and Rsin created the base, while also painting the entire piece. Rsin was able to bring Matt's sculpture to life by using one side of the color spectrum. With a lot of yellow and orange in this piece, it would have been great to see a bit contrast with color from the blue spectrum. Overall, Hindrance of a Whisper is a great collab piece and hopefully just the start of some future Matt A* collabs. Hindrance of a Whisper is available now on Matt A*'s online store, for $500 plus shipping. Be sure to follow both of these amazing artists on various social media. 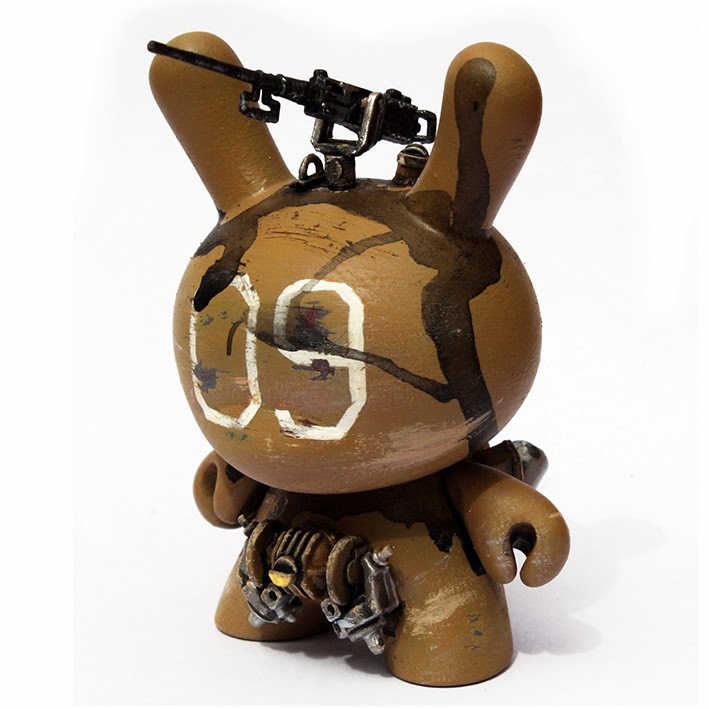 The Drones is a new blindboxed Dunny series by South African artist TheGiven. 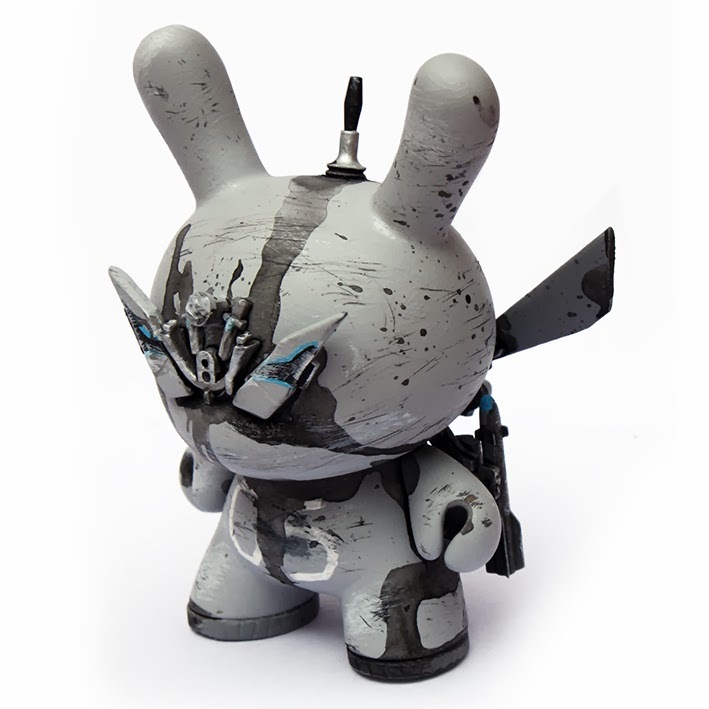 The set features 10 custom Dunnys, 5 "Tactical Aerial Drones" and 5 "Ground Support Drones". They are currently only available to buys in South Africa. You can see the full set and pick them up here. It seems the company has 2 people at the helm, Design is Tsutomu Nihei and Production is Yuta Tobari, some may recognise the name Tsutomu Nihei - creator of awesome manga Blame! Ive also spoken with Yuta a few times and seems his plans for 1000Toys are game changing. Why game changing?? 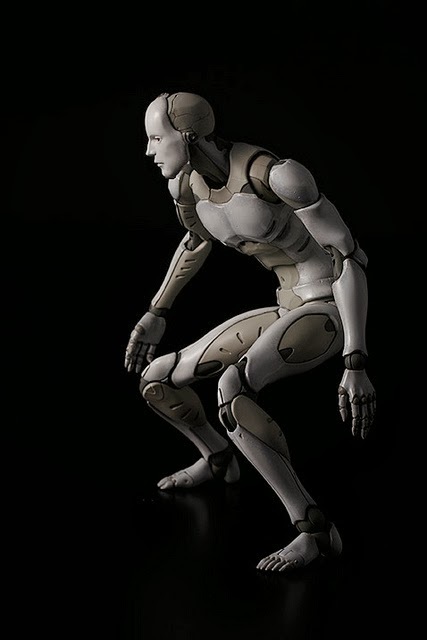 Well please take a look at these 1/6 bodies that are not far from production and we can see that we are looking into the future of 1/6 articulated bodies. I bet you the major players will want to take a close look at the engineering thats gone into this, just to a see how they accomplished the amazing articulation. As I mentioned, the official site is up an running but the sale of these bodies don't have a date yet, retail price is $120.00USD - they are as yet not offering these to dealers so the only way to get hold of one is through the official website. I for one is looking forward to getting hold of a few! ALSO - 1000Toys will be at the Clash of the Titans show I previously wrote about, so check them out this weekend. 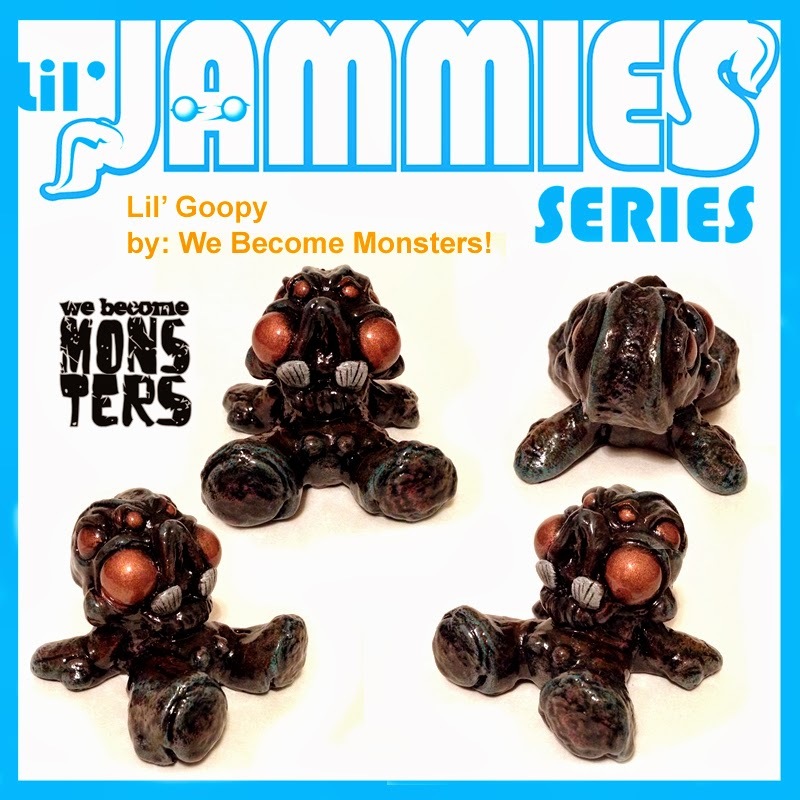 Lil' Jammie Series Customs from Fuller Designs! Hello. 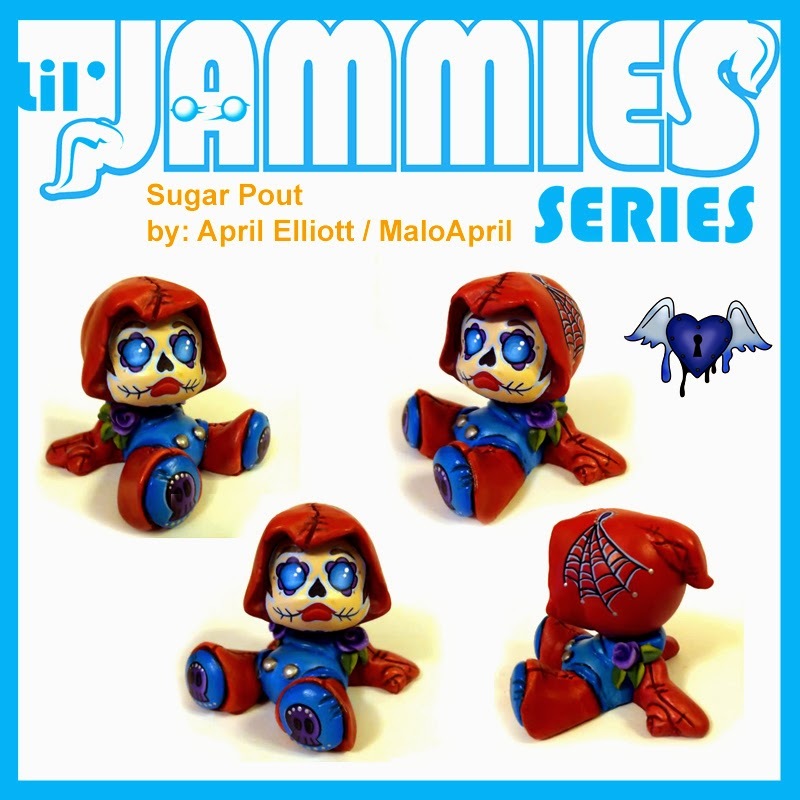 I am excited to release some new customs from a few talented artist for the Lil' Jammie Series. These 1 / 1 customs will be for sale online at 12:00 PM Central on January 31st here: http://liljammies.bigcartel.com/. Along with many others amazing customs. So don’t forget to bookmark this page! Thanks again and if you could help spread the word, I would really appreciate it! But lurking underneath all that.... there is a vast world of 1/6 figure customisation and production, creations that you may not know what the subject matter is but what these artist produce is somewhat amazing, I myself have a few pieces from these artist and its always a talking point when people visit my office. OK, Clash of the Titans - what is it? Joel Emslie, Winson Ma, Kenny Wong, RC Works, 1000toys, Psycho Customs, Zuno, Ligh BLACK, K13 Toys, Brac, HiKiKoMoRi Studio, makadi 3000, AX2 Studio. I'm sure you may of heard of a few of them. Shame I live so so far aways as this is a great opportunity to see so many talented artists work in one place, BUT if you live close then I suggest you head over to 1:AM gallery tomorrow for the opening night, you won't be disappointed. The latest edition of MAD's Modern Hero figure is the "Blackout" edition. Exclusive to MAD's online store, this edition is limited to 100 pieces. The figure stands 6" tall, with the hat on, and comes with a variety of different accessories. Packaged in a deluxe foam padded box, this is the third available colorway of MAD's Modern Hero figure. Since the figure comes directly from the artist, MAD, the figures come signed, unless otherwise requested. This is such a great piece, which contains some good use of contrasting blacks, utilizing a matte and glossy finish. Like the Grey and Skelecon edition before this, the Blackout edition retails for $65 plus shipping. Let the MAD collection grow! Carson Catlin has been cutting it up- the vinyl that is, and shares with us new pieces for upcoming shows. Carson contributes "Reticu-lloli", pictured above and below, for Toy Art Gallery's Vive La Lolligag. Reticu-Lloli has an antiqued finish, making the darker shadowed areas of many smaller cuts stand out. Reticu-Lloli will be available through Toy Art Gallery for $200, inquire info@toyartgallery.com for purchase. Carson also contributes "RWB" - red, white & black Munny to Menace Inc. Studio's Childish Playthings. Red, white & black is a colour palette Carson shows interest in continuing to explore, and with each colour having unique emotional or thematic connotations, I'm interested to see where Carson takes it. Carson also shares with us a commissioned piece recently completed. "Cadela Metal" was completed over the course of 8-9 months, and incorporates copper wire. Sekure D has been busy plotting a takeover! 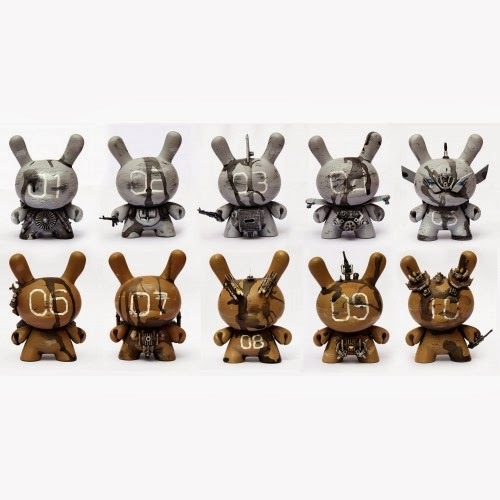 Ok, well it's not so much a takeover since he was invited, but, Sekure D's abstracted mechanized & graphic graffiti-inspired customs are taking Kidrobot locations and online store by storm. Coming soon to Kidrobot dot com and in-store locations; NYC, Bolder, LA and SF are new release series between 2-5 custom Munnyworld pieces sized 4"and 7". Each piece is individual and unique, one-of-a-kind, so be sure to snap up your favourite before someone else does. Toy Art Gallery says Vive La Lolligag! Toy Art Gallery and Lolligag World bring us a new group exhibition featuring more than 35 artists from across the country and around the world. Artists contribute their interpretation of the 6" Lolligag platform, opening January 11th at TAG. Aimee Kuester, Amy Sol, Ani Eos, Ayleen Gaspar, Babyvtec, Bere + Bere, Brent Nolasco, Carson Catlin, Doubleparlour, Felix Meunier, Gabbie Custom Art, Genevive Zacconi, Holly Conrad, Hyperactive Monkey, Ian Ziobrowsk,i iRoc, J.Salvador, Jason Freeny, Jeremiah Ketner, Jon-Paul Kaiser, Juan Muniz, Kat Brunnegraff, KMNDZ, Laura Mas aka Okokume, Leesasaur, Liz McGrath, MeSmithy, Miso, Nathan Hamill, Obscure, Onch Movement, Ragnar, rAsk Opticon, Sean Christopher, Tan-Ki, Tasha Zimich, Tomi Monstre, Vanessa Ramirez, and more! Join the party 7pm opening night for a selection of exclusive Lolligag prints and jewelry, and exclusives for gallery guests. RSVP to the event Facebook here.